These yummy samosas are perfect to munch on as an evening snack. They are filling and can be served for breakfast as they are not crispy. They are crunchy yet soft. 1. In a mixing bowl, add the wheat flour and salt and mix well. 2. Add water and knead it to a soft but stiff dough. 3. Cover and keep it aside. 4. In a non stick vessel heat oil. 5. Add the onions and fry till they turn translucent. Reduce flame. 7. 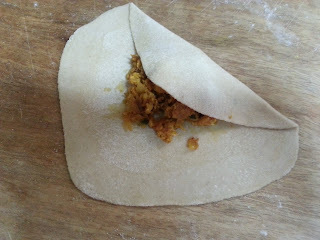 Add chilli powder, salt and turmeric and mix well. 8. Add the chopped tomato and mix well. 9. Break the shell and add an egg. 10. Start mixing it really well by ensuring that no egg is sticking to the base or sides. 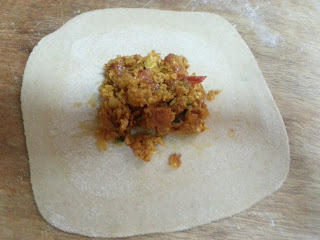 The egg needs to be broken to small pieces to resemble mince. 11. Add the coriander leaves and keep stirring. The egg needs to cook well. 12. Turn off the flame when the oil starts to separate. Remove it in a plate. Let it cool down completely. 13. 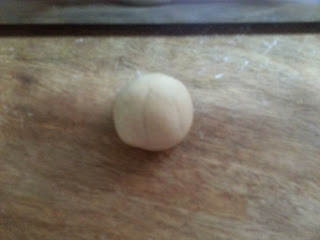 Divide the dough into 6 equal small balls. 14. On a slightly dusted surface roll out the dough to a disc. 15. Do not roll it too thin. 16. 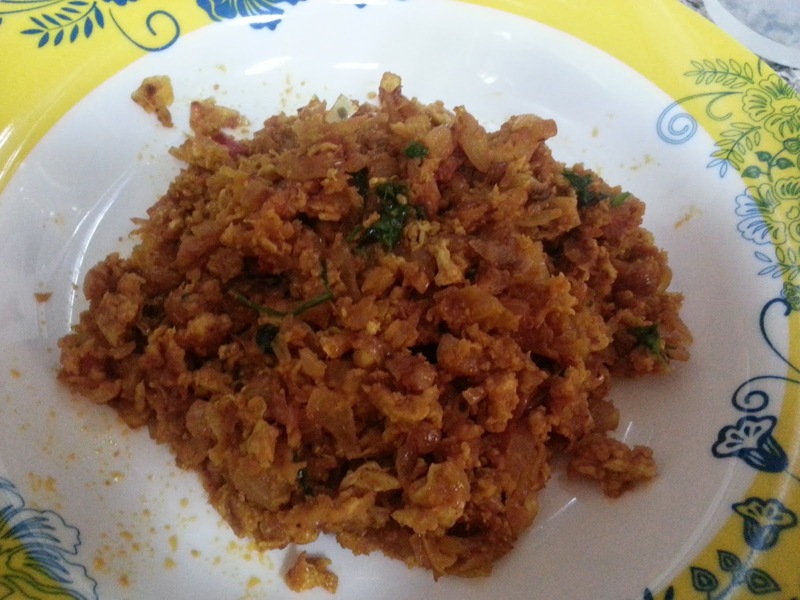 Place a heaped tablespoon of the egg filling in the center of the disc. 17. Dip your finger in some water and apply it all around the circumference of the disc. 18. Fold one side over the filling pressing gently to seal as shown below. 19. 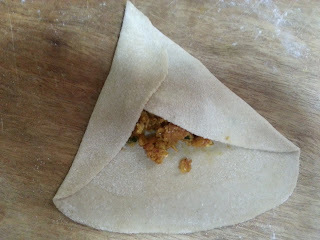 Fold another side to cover the first side by pressing gently as shown below. 20. 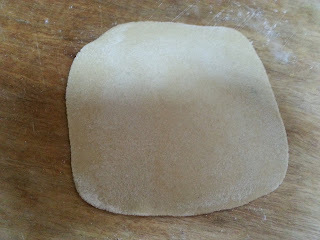 Fold the bottom part of the disc to finally seal by gently pressing as below. 21. Repeat the steps to prepare all samosas. 22. Heat oil for deep frying. Reduce flame to medium once oil is hot. 23. 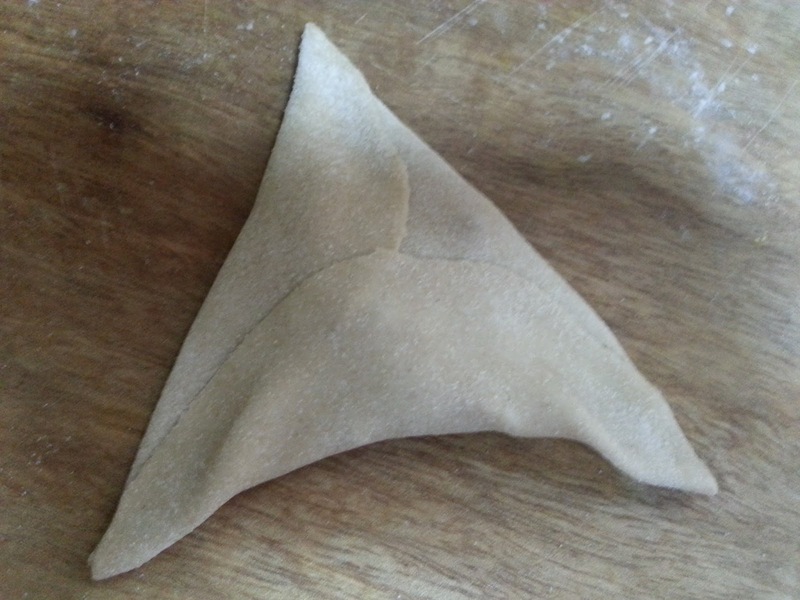 Fry the samosas one by one by dropping the sealed side facing down or else the samosa may open up. 24. Turn it a few times and remove once golden on both sides.